For children and adults to learn the safe & fun skill of air rifle marksmanship Ideal for youngsters aged 8+ and the complete novice. 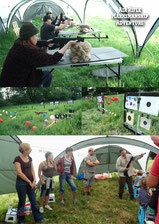 A fun taster session designed to introduce the skills of marksmanship using novel targets. All shooting sessions will start with safety briefings followed by the correct methods of safe shooting. Range Safety - Rifle Safety - Range Commands. All under 18's must be accompanied by a parent or guardian. A 14 - 18 year old with a parent or guardian may have an Air Rifle each. You will need to book 2 Air rifles.